Huge congratulations to Hayley and Chris who celebrated their beautiful wedding in the early Autumn sunshine at The Rayleigh Club, Rayleigh. This was an unusual wedding cake order as I was contacted by the Groom’s Aunt in Ireland who wanted to order the cake as a wedding present for the happy couple; so with a request for flavours and a picture of the wedding cake they wanted I sent Jacki (the Aunt) a quote and the cake was ordered! Simple. 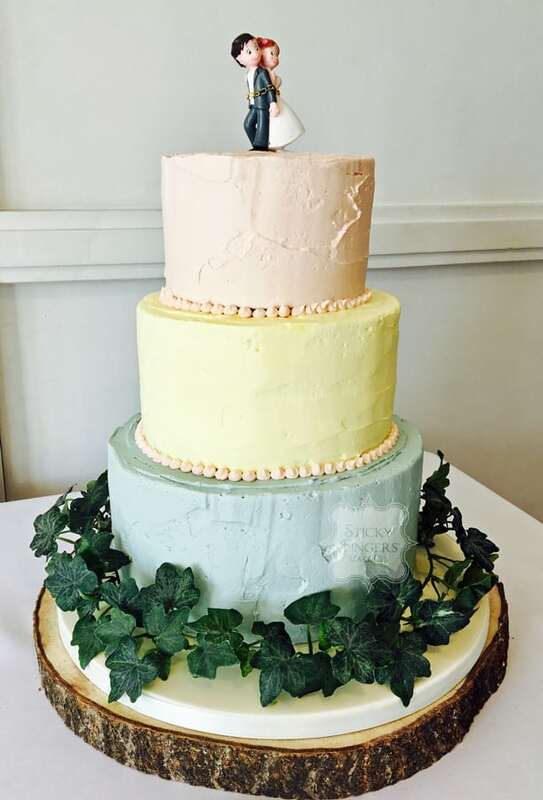 They chose a pastel coloured buttercream cake, powder blue, lemon and baby pink and the flavours were Madagascan vanilla with raspberry jam, rich dark chocolate and lovely lemony lemon cake. I heard from Hayley just after the wedding and they were so happy with their cake which is so lovely to hear. I wish you a long a happy life together.